A major consideration for people considering Workamping is “How many hours will I work for my site?” Personally, I like to respond with a big fat ZERO… but sometimes it’s just not the case. Some employers will not provide a free campsite as part of your compensation and they will want a set number of hours worked to cover its cost. In this situation, since your job duties will depend on your position and the working environment may or may not be seen as an added benefit along with any other perks, you will need to compute how much you are being asked to pay for your site. Decide if the hours worked are benefitting you, the employer, or both. Monthly Value: equal to the site rental fee (either based on the monthly or seasonal rate) + monthly utility cost + value of perks or additional benefits provided by the employer. Step 1: $650 monthly site + $150 utilities + $100 perks = $900 monthly value. If this ever comes out to even a penny below the minimum wage, I would strongly suggest you rethink the decision to move forward with the job opportunity, unless there are huge benefits to being in that location during the specific time period the job would run. Also, if there is not a monthly rate available you should use the seasonal rate or something equivalent, but definitely not the daily rate by any means! It’s very typical now to see many jobs offering a site plus pay. These jobs will pay a general range of somewhere between $8.00-$12.00 per hour. If you can confirm a position with an employer who is paying $10.00 or more per hour and offers a FHU (full hook-up) campsite for FREE, you are doing well! I don’t say that to be cute, mean or funny… I say it because it is the absolute truth and I think you need to know this upfront. I want to help set realistic expectations and let you know from the start that you will not get rich Workamping! If making big bucks and living lavishly is your thing, this might not be the life for you! Also, now is a good time for me to mention that depending solely on your income from Workamping jobs is not a good place to start. Not only have I been there and done it, but I did not enjoy it and it didn’t last long. Workamping is much better lived with some other source of monetary funds flowing in. I like to think of it as a way to decrease costs and help pay the bills. It will not afford the luxuries of eating out, buying nice things, exploring the top tourist attractions, or even paying off pricey payment for big rigs with big notes. Workamping is not a career. You will not find career type wages in comfortable desk jobs with employee benefit plans offering a 401K and stock options, but it can still be a fulfilling way to earn some income while you travel! This lifestyle is typically centered around jobs in the outdoor hospitality industry and you should expect to be offered positions that involve interactions with the public as well as some based on basic computer skills. It’s easy to feel like your past experience in careers that may have dominated your previous life would deem you as overqualified for the majority of Workamping positions regularly advertised and you’re probably right to feel this way! You are likely very over overqualified for 90% of the jobs you will be asked to complete, and this makes you the perfect choice for Workamping employers! Workamping employers are tired of hiring from the local employment pool which includes people too close to home and those who may have just entered the workforce. They’re looking for Workampers to diversify their team! They long for the chance to hire someone with a skill set they can depend on for knowledge as well as the professionalism that comes along with it. Workampers looking to leave behind the pressures of working careers and fast-paced jobs are in luck. employers are looking for you! Include details about your field of expertise and areas where you have thrived in the past on your resume. If an employer is looking for someone who has electrical or sales skills, your resume will stand out if you are open to sharing this information! 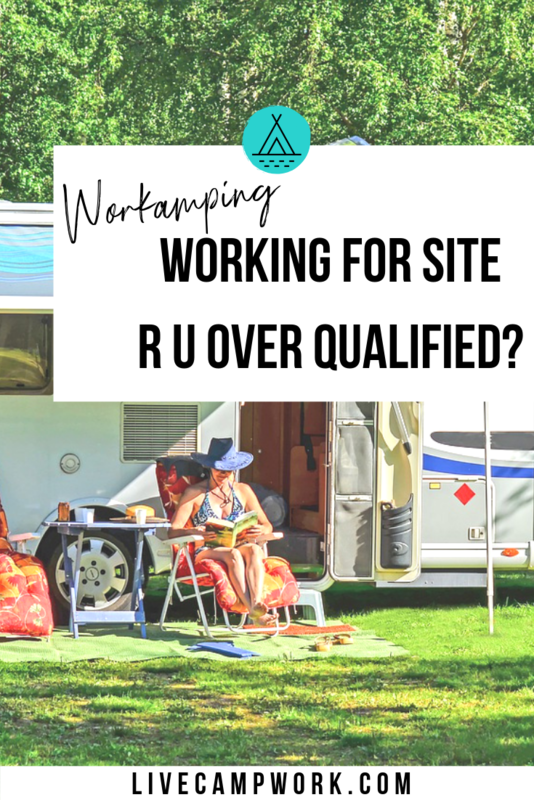 Here is my advice… Think thoroughly about how Workamping will fit into your life, or your new life as an RV traveler before you jump in. Hitting roadblocks are not fun when you don’t have the time, patience or available resources to figure your way out. Do yourself a favor and get your house in order before you start this journey. You will be thankful that you did!